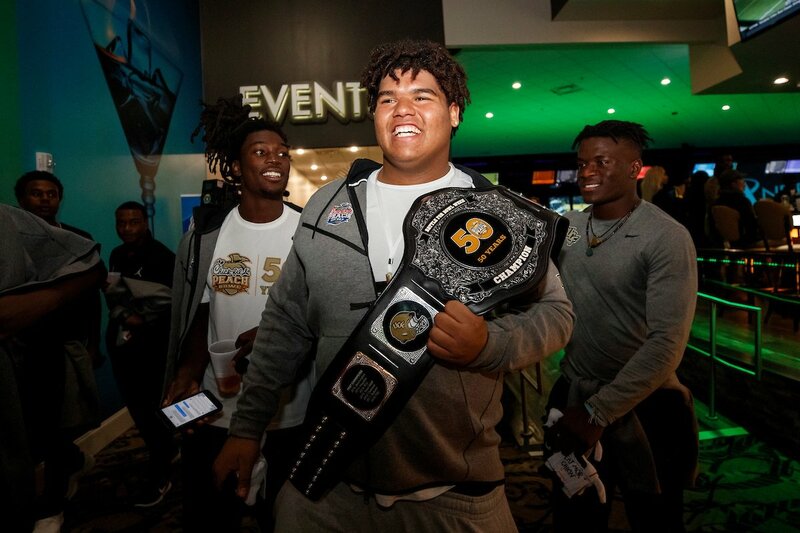 ATLANTA, Ga. (FNN SPORTS) – UCF took home the first Batte for Bowl Week competition defeating Auburn in the Andreti Indoor Karting race with a faster time of 22.69 seconds to 22.91 seconds for Auburn. Players from both teams were given the opportunity to test their driving skills, with the winner being determined by the quickest average total lap time between the teams. Before the teams face off on the field, No.12 UCF and No. 7 Auburn will battle it out in a series of competitions throughout Bowl Week, vying for the coveted Battle for Bowl Week Belt. Bragging rights aren’t the only thing at stake. The winner of the Battle for Bowl Week has gone on to win the Chick-fil-A Peach Bowl in six of the last seven games and is undefeated in non-Semifinal years. Each team will participate in go-kart racing at Andretti Indoor Karting. Team members will be given the opportunity to test their driving skills as part of the competition for this event. The average lap time for each team will be totaled and the team with the quickest average time will be declared the winner for this event. Five members of each team will participate in a Basketball Challenge in their respective team hotel for the highest score. Each player will receive their own 45 second round to shoot from various locations around the hoop, with each place being worth a different point total. Highest cumulative team score will determine the overall team winner for this event. Four members of each team will participate in this game. Teams are shown multiple choice questions and have 15 seconds to discuss. They are then allotted a fixed amount of points they can wager on each answer. One-by-one incorrect answers drop off the screen along with any points they wagered on that answer. The team with the most points at end of the game wins. Four offensive players, four defensive players and two assistant coaches from both teams will square off in a football version of the popular game show “Family Feud.” Each team will attempt to name the top answers to questions asked. Football Feud is a two round game. The team with the highest score at the end of the two rounds (or a tie-breaker) will be declared the winner for this event. A fifth competition will be played if we are tied after the four main Battle for Bowl Week events.